A blurry picture of the headlines snapped with my iPhone because I really wasn't planning to blog about the elections. Yesterday was a very important day - not only will it go down in history as the day that Gwan kindly took me on the "Super Best Tour Ever of Tours", but it was also the day after the presidential elections in France. 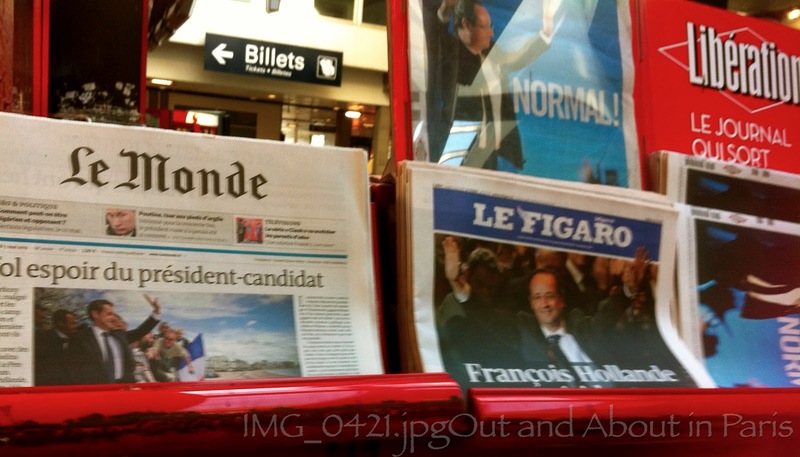 Riding the metro to Gare Montparnasse in the morning, I studied the faces of my fellow passengers, most of whom were reading newspaper articles about President-elect François Hollande, to determine how they felt about the results. If they looked pleased, I wondered if lived in the 20th arrondissement, where 71.83% of the residents voted for Hollande. If they appeared worried, I speculated that perhaps they were my neighbors in the 16th arrondissement, where Nicholas Sarkozy received 78.01% of the vote. Never had I felt myself to be more of an outsider in Paris. So, I did what any self-respecting American expat would do - I bought a Herald Tribune (to hell with French newspapers) and a big cup of American coffee from Starbucks (forget about tiny little espressos) and settled into my seat on the TGV. No doubt about it, I was in an expat funk. Fortunately, I had such a good time chatting with Gwan that I completely forgot about French politics. Or at least I put them out of my mind until I received a message from my daughter asking if I had read the Op-Ed in the New York Times written by Rosecrans Baldwin, the author of Paris, I Love You but You're Bringing Me Down. When Sara added that she found it strange that I hadn't blogged about the elections, I responded like a rebellious teenager, "It's not my country - I only live here. The French can do whatever they want!". In case you're not an expat and can't figure out why I was acting like such a petulant child, let me explain. Past experiences in other countries have shown me that no matter how much I feel like an insider, I'm not. I'm an American living in a foreign land. That's why my Filipino neighbors advised me to send our cook to the market rather than going myself when there was a coup in the Philippines and why I had to tell our children to crouch down on the floor of our car when we drove through streets filled with angry villagers armed with stones and machetes during a period of political unrest in Indonesia. Countries are like big families. They don't want to hear a foreigner's opinions when they're trying to decide if they want to spend the next 5 years with Uncle Nick or Uncle Frank. I'm just thankful that the French declined Aunt Marine Le Pen's invitation because she scares the living daylights out of me! To President-elect Francois Hollande, I wish you success. After all, Stéphane and I hope to live (and pay taxes) in Paris for four more years. It's our home, even if we are outsiders. Excellent point. I completely agree, MK. Who cares what we think? I love how direct you are in this post. You know, I wasn't on planning on blogging about the elections either and had a post about Fauchon ready to go for Monday but after experiencing Sunday night, I just couldn't resist talking about the evening itself, and the experience of being abroad during such a historical moment. It brought me back to Obama's 2008 victory. I've never felt so much energy in Paris before. It was such a great night. ...and you met Gwan?!?! NOW I'm jealous! How great that you two met up! She's so lovely. I'm dying to meet her. Yes! I met Gwan - she's wonderful! I asked her to come to Paris and hopefully she will. Perhaps you can entice her with a night out in the Marais because she has never been there before. I was happy that you blogged about the elections, Ella. I told Sara to read your post since she was interested in knowing more about how it felt to be in Paris on election day. We stayed at home Sunday evening and waited for the official announcement on French tv at 8:00 pm. (even though everyone already knew the outcome). We even heard a few drivers honking their horns to celebrate...yes, even in the 16th. As for being an outsider, usually it doesn't hit me so hard but I realized that none of the French people whom I asked about the elections ever reciprocated by asking my opinion, even the ones who know that I live here. But then, I haven't asked Stephane's opinion about the upcoming elections in the USA either. I guess that we're exclusive when it comes to our own country's government. Yikes Mary Kay, you seem to be often in countries with unstable governments--maybe you should consider staying in Switzerland. I really enjoyed reading your response to the election, very personal and immediate. And I hope you're in France for the next four years too, especially as I know there are hot chocolates you haven't documented yet. People used to tease me that they could track my movements around the globe and know which government was going to have problems next. Fortunately, that trend ended when we moved to Trinidad. Living on so many islands made me very aware of the fact that it's not easy to leave one in times of trouble...unless you have a boat! I also hope that we're in France for another four years. You're right - there's still a lot of hot chocolate to sample. Plus, I hope that we'll still be here during your next trip to Paris! Bravo for being a rebellious teenager once again! Thank goodness Auntie Marie was put on the back burner for another five years or else all the expats would be shaking in their boots right now. And I hope one day you might share more adventures from your previous expat experiences in other countries. The snipits we get here and there are just fascinating. Yeah, it's good for the spirit to rebel every once in a while! I'll see what other snippets I can work into the blog - one of my upcoming posts is going to feature some of our friends from Indonesia. They're American diplomats who have lived through some amazing experiences. Well, you know who served as the inspiration for this post - or shall I say the person who "encouraged" me to write it! I have now been French for several years and have voted in two French presidential elections. I blogged about the election process but not about the actual elections. I loved what Finding Noon wrote (she's featured alongside your post on Chambord today in my Wednesday's other people's blogs post) because it exactly reflects how I feel about elections here but I'm still not ready to write my own post! The whole mindset is so foreign to me. I also enjoyed reading what Finding Noon wrote about the elections because she has lived here much longer than me and is truly integrated. Interesting that the mindset remains foreign to you. That's a subject that I hope we'll have the opportunity to talk about in the future. MK - this was great. i pulled up baldwin's article a few days ago but haven't read it yet. I completely understand how you felt (and also just have to buy the tribune and a starbucks sometimes too!) but I also was surprised at how parts of me actually cared and got excited about the election here. I'm assuming it's because we'll be here for another four+ years so the outcome of this election can potentially have impact on our time here. I felt myself excited to hear the results and doing a lot more reading on the candidates. I also have so enjoyed seeing how the French handle the process versus the Americans. And so true, thank goodness there was no Aunt Marie! It was definitely exciting to be here during the elections and to watch the process unfold. Thank you for being so forgiving, Kiki! :) I promise that I don't drink Starbucks on a regular basis - that's what was so strange about Monday because I don't even like Starbuck's coffee and usually drink tea. It just seemed like the thing to have when I was in my expat funk. At least I didn't buy a donut at Starbucks to go with my coffee! I feel very left out too, but I'm in the process of applying for French citizenship so I'll be able to vote in the future. I hope that you'll have your French citizenship soon and will be able to vote in the next election! Very interesting post Mary Kay. Do you have a vote in France? I too am intrigued by the snippets of information from other places you have loved....maybe one day you will write a book. I am not an expat, but because I visit Paris often I get a "feel" for French politics more than most Brits. So I watch with interest from afar. Of course, like you I wisely (I hope) never comment on the politics, religion or sport of another country and unless people have the vote, I do not think others have the right to comment on politics etc in my country. However I LOVE your little personal, partisan stance with the Starbucks and the Herald Tribune.....Vivre la Difference! No, I'm not allowed to vote in France because I'm not a citizen. It's normally not something that bothers me because I completely understand why expats can't vote, but this election was an exciting one. I would have liked to have taken part. I'll just have to wait until November to vote in the American elections. Can you imagine what it must have been like for women before we could vote in our own country. Awful! And I agree - Vivre la difference! Our experiences are different from one another's so it's hard to generalize that the French would react this way or that way when it comes to politics. I was not in France during this political season, but I watched interviews of the candidates, the debate between Hollande and Sarkozy, and the post-election speeches and commentaries and I know I will get a chance to discuss what has transpired with French friends and extended family (who are French citizens) when I'm in Paris in a few weeks. The French people I have met are usually ready to discuss just about anything, including politics in France and/or the US. Sometimes they even want to talk about American televison, but that's another ball of wax! It's true that the French are ready to discuss just about anything. I find their openness and inquisitiveness very refreshing. While I talked about the elections and candidates with an assortment of French people, it was interesting that none of them asked who I would vote for because they know (and I know) that I can't vote in their elections. It's not having voice in the country where I live that is the most difficult. But it goes hand-in-hand with being an expat. I'm sure that you'll have lots of interesting discussions with friends and family while you're in France - the group of French people with whom I was with yesterday had much to say about the forthcoming changes. One of the big questions is if Hollande will appease other heads of state by marrying Valerie.